Arraystar nrStar™ Human snoRNA PCR Array profiles 359 snoRNAs, 7 snRNAs targeted by snoRNAs, and 4 mRNAs encoding the snoRNP complex members. The array is a powerful tool to conveniently and quickly analyze the expression profiles of the snoRNAs in tissues or cultured cells, with high sensitivity also for serum or plasma extracted RNAs. Functionally active in cellular processes: rRNA processing, alternative splicing, translation, and oxidative stress. A source of biogenesis of short miRNA-like RNAs capable of targeting mRNAs and thus regulating translation. Acting as tumor promoters or suppressors; Also involved in other human diseases. Stable in biofluids such as plasma, sputum, and urine, presenting a promising new class of RNA biomarkers. 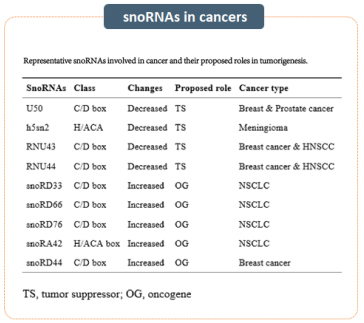 Why choose nrStar™ snoRNA PCR Array? Optimal content coverage - Covering all PCR-distinguishable snoRNAs, target snRNAs and mRNAs for snoRNP protein members all in one panel. High sensitivity - Profiling all snoRNAs with as little as 50 ng total RNA. Proven performance - All assays on the panel are fully experimentally validated with RNAs extracted from cultured cells, tissues, sera and plasma. Fast biomarker discovery – Screening potential biomarkers easily and fast in standard 384-well plate format qPCR; Quantification accuracy good for validation.